The ultimate high tech game of tag! Play inside or outdoors, day or night. As you are blasted your receiver vest will gradually change colour. When you hit ten times you’re out! Complete with voice coach guidance, full colour lighting effects, stereo sound and music, Laser X really is the complete gaming experience. 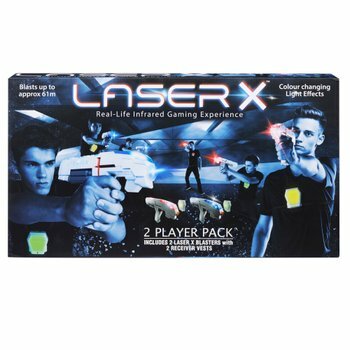 Where can I buy Laser X Double Pack? Get ready for the ultimate game of laser tag! Play inside or out, day or night. Play as team red, team blue or go rogue! Works up to 60 metres away with pinpoint accuracy. Gameplay allows unlimited players. As you take damage from your opponents your receiver vest will gradually change colour, get hit ten times and you’re out! Complete with voice coach guidance, full colour lighting effects, stereo sound and music. Laser X really is the complete gaming experience! Contains 2 Laser X Blasters & 2 Receiver Vests. Spend a weekend in a wintery log cabin at the Snow Resort with Andrea and Amy with this LEGO Friends Ski Chalet 41323. Take the snowmobile out for a ride or hop into the outdoor hot tub to warm up. Prepare a meal for your friends in the kitchen, then snuggle up on the sofa near the fire with the husky puppy and talk about all the winter fun you’ve been having. Head upstairs for a good night’s sleep, ready for another day of fun in the snow. 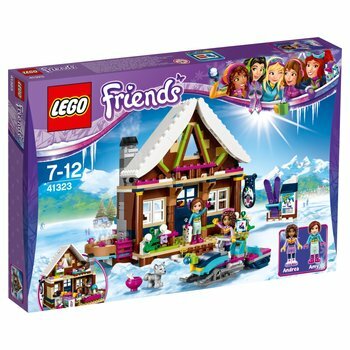 Where can I buy LEGO Friends: Winter Holiday Snow Resort Chalet (41323)? Lots of fun with this 5 Second Rule Game. It should be easy to name 3 breeds of dogs; but can you do it under the pressure of 5 seconds twisting away? Times not on your side, so just say whatever comes to mind and risk ridiculous answers slipping out! Its all in good fun with this fast-paced family board game. 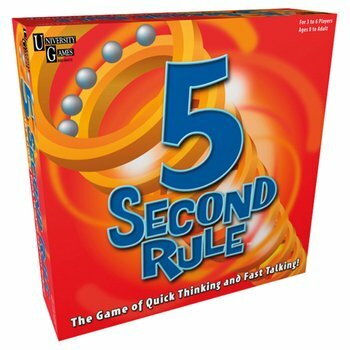 Where can I buy 5 Second Rule Game? Can you keep calm under pressure? With just 5 seconds to answer what should be a simple question, this fast-paced game will have you saying whatever comes to mind. With many ridiculous answers likely to be given, this fun-filled family game is likely to be a laugh a minute – or every 5 seconds. Take great selfies and pictures with your friends with this VTech Kidizoom Duo Camera that features two lenses that can switch with just the press of a button. Now with a 5 megapixel sensor. Add special effects to your movies and photos or have fun playing the 5 built-in games! The VTech Kidizoom Duo Camera also features 4x digital zoom, a voice recorder, an auto- portrait feature, Wacky Photo Shaker, photo editor, a Silly Face Detector and 2.4 inch colour screen. 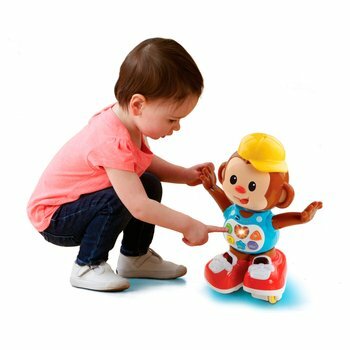 Chase me Casey, the adorable and cheeky little monkey from VTech, dances and skates around encouraging your child to dance with and chase them! Sensors detect when your child is near, making Casey respond with sounds and motion. Where can I buy vtech Chase Me Casey? Product InformationGet your skates on and prepare for fun with this cheeky little monkey! Casey loves to get little tots on their toes and encourage them to chase him by skating away as soon as they get near! Casey also loves introducing little ones to numbers. body parts. music and much more � not bad for a cheeky monkey!